Alan Mulally could act as a mentor to Ford's next CEO on an interim basis. Alan Mulally will be a hard act to follow as CEO of Ford Motor Co. The former Boeing executive, who arrived in Detroit in 2006 to a chorus of skeptics, pulled off what Time magazine called "the biggest business turnaround of the Great Recession." In the process, Mulally transformed Ford's culture, made employees believe in themselves again and became, in the minds of some, a folk hero. But Mulally is 66, which means the company's board of directors has to consider successors, even if his departure date is uncertain. Joe Laymon, Ford's former vice president for human resources, created a fire storm in 2008 by identifying several candidates to succeed Mulally, and Ford-watchers say four of them now lead the pack. -- Mark Fields, 50, president of the Americas, currently the front-runner. -- Lewis Booth, CFO, 63. Booth might be the choice if Mulally were to retire soon. -- Jim Farley, 49, group vice president of global marketing, sales and service. -- Joe Hinrichs, 45, group vice president of Ford Asia Pacific and Africa. The wiry, athletic Mulally seems happy to stick around. And insiders say the company probably will let him leave on his own terms. "He continues to do well," said one former Ford executive, adding that statements from Executive Chairman Bill Ford suggest that Mulally "can continue to stay there as long as he wants." When Bill Ford Jr. stepped down and Ford recruited Mulally from Boeing in 2006, Ford's North American automotive operations had lost $9 billion in the previous five years. Mulally has restored Ford to profitability and bolstered its stock price. Now he has set his sights on restoring the stock dividend and regaining an investment-grade credit rating. But Ford will have to face the issue in the next few years, which raises the question: Might Ford bring in another CEO from outside, as it did when it recruited Mulally from Boeing? That appears unlikely. Hiring from the inside would send a message of stability to Wall Street and to company employees. A former executive said that bringing in another outside CEO could trigger an exodus of passed-over Ford executives: "How do we keep the troops motivated if we do keep going to the outside? The Fieldses, the Hinrichses are going to walk." 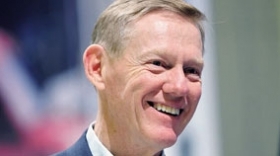 One solution might be to keep Mulally around as CEO emeritus or vice chairman. That option is complicated by the fact that Bill Ford is already executive chairman. "You might have an interim step where they put somebody in as a leader that he mentors," the former executive said. "That wouldn't surprise me. That would keep Wall Street happy as well, because one of the things they're going to have to think about is what the impact will be when Alan announces. Succession does have an impact on the Street." That puts the emphasis squarely on the four leading internal candidates. Most industry folks close to Ford believe the company is unlikely to look beyond those four. Says one: "I don't see the need to go deeper and surprise people. The only issue for me is: Do they want Mulally to lead for another year or two?"